Objective: Radiofrequency (RF) coblation operates at low temperatures (40–70°C) and allows for ablation, hemostasis, and aspiration, in addition to the lesion excision; thermal damage to the surrounding tissues is thus minimized. Herein, we evaluated the benefit of low-temperature RF coblation treatment of the early-stage glottic cancer. The main aim of the study was to evaluate the feasibility, complications, and efficacy of low-temperature RF coblation as a treatment modality for the early-stage glottic cancer. Materials and Methods: The data obtained from a 1-year study of six T1 glottic cancer patients treated at our department are presented. Six early-stage glottic cancer (Tla = 5; Tlb = 1) patients (male; mean age 60.1 years) treated using low-temperature RF coblation were enrolled in this study. Results: The outcomes of the surgical technique were analyzed. Statistical Analysis Used: Study outcomes were analyzed (noted and/or photographed). All patients were able to eat on the next day after the surgery. No gastric tube or tracheotomy was required. No postoperative cough, discomfort or difficult breathing was noted. No complications, such as recurrence or cervical lymph node metastasis, occurred over the 6–12 months follow-up. All patients regained satisfactory voice 2 months after the surgery. Conclusions: Although the current probe design has limitations for the resection of certain tumors, low-temperature RF coblation appears to be a potentially effective method for the endoscopic resection of selected glottic cancers. In the traditional surgical treatment of early laryngeal cancer, tracheotomy is required before partial laryngectomy can be performed. With the further advancement of microsurgical techniques and surgical instruments during recent years, laryngeal microsurgery treatment under laryngoscopy has achieved satisfactory results. Low-temperature radiofrequency (RF) coblation is a new surgical treatment used in the nose, nasopharynx, and throat. This method has been used in the treatment of cancer and other diseases in recent years. The traditional surgical treatment is more prone to cause surgical trauma and bleeding due to the deep surgical site. Compared with the traditional surgical treatment, low-temperature RF coblation technique has yielded better outcomes. However, the efficacy and clinical benefit of low-temperature RF coblation for the treatment of glottic cancer remain unclear. Therefore, the aim of the study was to evaluate the feasibility, complications, and efficacy of low-temperature RF coblation as a treatment modality for the early-stage glottic cancer. Herein, we report these data obtained from six T1 glottic carcinoma patients that were treated at our department during the time period from January 2011 to January 2012. The procedures followed in this study were in accordance with the Ethical Standards of Helsinki Declaration of 1975 (revised in 2000), and the study was approved by the Institutional Ethics Committee. Written informed consent was obtained from all participants before inclusion in the study. Six patients with glottic carcinoma were consecutively enrolled in this study. All patients were male and were of age from 55 to 72 years (mean age: 60.1 years). There were five cases of T1a5, and one case of T1b1 type according to the tumor-node-metastasis staging criteria-2002 of the American Joint Committee on Cancer. None of the patients had received any prior treatment. Preoperative laryngoscopy and enhanced computed tomography of the larynx (with iopromide as the contrast agent) were performed to evaluate the paraglottic and preepiglottic spaces and thyroid cartilages as well as the presence of neck lymph node metastasis. Tumor type was determined as T1N0M0, and the pathological diagnosis revealed squamous cell carcinoma in all cases. The various surgical instruments used included a set of laryngoscope systems and microsurgical instruments (Karl-Storz, Germany), an OPMI1-FC type operating microscope (Carl-Zeiss, Germany), and the Coblator plasma surgery system (ArthroCare, USA). The surgery was performed under general anesthesia with oral intubation. Pillows were placed under patient's shoulders. The adjustable laryngoscope was orally inserted to expose the glottis, and the microscope was adjusted to a good focal point for a clear operative field. As soon as the tumor was visible under direct vision with the surgical microscope set at high magnification, ArthroCare Coblator plasma surgery system was used to complete the operation. The controller was used to set the initial energy level at 7 (ablation), coagulation at 3, and foot pedal control was used to manipulate the EIC7070 scalpel (25 mm) in combination with both hands. This system enabled multi-angle operation with simultaneous aspiration, bleeding control, and ablation while the saline infusion and aspiration were done from the head of the scalpel so that any residue, secretions, and blood could be removed at the same time from the ablated tissue to maintain a clear operative field. Thus, the tumor boundaries could be clearly defined with a safe margin of about 2 mm. Each tumor was completely resected at a time during surgery, and no fractionated resection was employed. The procedure was completed as soon as the intraoperative pathology confirmed the negative margins. In the case of a positive margin, extended resection was conducted until a negative finding was achieved. Postoperative intravenous antibiotics and ambroxol hydrochloride were routinely administered in conjunction with intravenous dexamethasone to prevent the laryngeal edema. Budesonide inhalation was prescribed, and the patients were asked to avoid speech until 1 week following surgery. Study outcomes were analyzed (noted and/or photographed). The pre- and post-surgical representative photographs of original tumors in case 1 [Figure 1] and [Figure 2] and case 2 [Figure 3] and [Figure 4] are shown. All patients were able to eat on the next day after the surgery. No gastric tube or tracheotomy was required. No postoperative cough, discomfort or difficult breathing was noted. At the 7th postoperative day, laryngoscopy revealed hyperemia and edema of the wound surface with a pseudomembrane formed from protein exudates. One month later, the wound was covered with new mucosa and the vocal function improved significantly. Two months later, the vocal function returned to normal and was significantly better as compared with that of patients who had undergone laryngofissure or partial laryngectomy. All patients were followed for a time period of 6–12 months (average: 10 months). No recurrence or cervical lymph node metastasis was observed. The short-term efficacy was satisfactory, and no complications such as laryngeal web formation, wound infection, and wound bleeding were observed. All patients lived a normal life and resumed routine work and activities with the improved quality of life. Since the 1990s, the treatment focus of laryngeal cancer has largely shifted to functional preservation techniques, and minimally invasive surgery is always preferred, whenever possible, to maximize the residual function after surgery so that patients may maintain a better quality of life., Traditional surgery for the early laryngeal cancer is associated with longer postoperative recovery, multiple complications, and a poor vocal function. In recent years, a number of studies have reported on microsurgery performed under laryngoscopy for the treatment of laryngeal cancer. Carbon dioxide laser surgery has been applied in the treatment of early laryngeal cancer as a revolutionary landmark.,,,, Although this technique has benefits such as smaller surgical wounds and a quicker recovery, it also poses reasonable risks of laser-induced thermal damage such as respiratory burns, vocal adhesions, severe hoarseness, and a mistaken laser ablation of the endotracheal intubation may even lead to tube explosion. Notably, low-temperature plasma RF ablation (RFA) is an emerging patented technology that was approved by the USA Food and Drug Administration in 2000 for use in clinical applications.,, In the recent years, it has been widely used in the field of otolaryngology and head and neck surgery. It utilizes bipolar RF energy to transfer the electrolyte solution between the scalpel tip and the tissue into a thin layer of plasma. As the charged particles in the plasma are accelerated by the electric field, the energy is transferred to the tissue and disassembles the molecular bonds forming cellular components in the target tissue so that cells inside are disintegrated at the molecular level and decomposed into carbohydrates and oxides to cause coagulative necrosis of the tissue. The necrotic tissue will then shed or form scar contraction, resulting in reduced tissue volume as the effect of resection. With the use of a voltage-modulated RF controller, low energy output is maintained and confined to the tissue surface during the procedure. Therefore, at a relatively low-temperature (40–70°C), thermal damage to the surrounding tissue is minimized. It is different from the conventional RFA that uses a power-modulated RF controller, which exerts heat generated by the RF currents onto the human tissue to cause coagulative necrosis while the laser and electric knife may produce high temperature (up to 400–600°C) that is likely to cause thermal damage to the surrounding tissue. RFA operates at low temperatures and enables ablation, hemostasis, and aspiration, in addition to the lesion excision, and this is why it has been widely used in the field of otolaryngology - head and neck surgery in recent years. Although its application in the surgical excision of benign lesions at the nose, throat, and other sites has been reported, fewer studies have used this technique in the treatment of malignant cancer. Carney et al. compared the RFA and the CO2 laser ablation in patients with head and neck squamous cell carcinoma (20 patients vs. 20 patients) and found that the RFA was more effective and less time-consuming.,,,,, Since the introduction of low-temperature plasma surgery system facility at our department, we have carried out numerous throat operations. and the surgical team is adept at using CO2 laser surgery for the treatment of vocal cord cancer and many benign tumors of the throat. Herein, we have performed plasma surgery for a select group of early vocal cord cancer patients (confined to type-1 glottic cancer without neck lymph node metastasis) and have achieved a better outcome. Overall, we have gained valuable experience from these six patients included in the study. Since this technique is applied at low temperatures, it has generated a better protective effect on the throat mucosa has a shorter recovery time and causes less postoperative pain as compared with the techniques using laser and monopolar electrocautery. After vocal cord RFA, the voice recovery was faster than that following CO2 laser surgery. However, due to the small number of patients included in this study, we caution that these findings need to be taken only as the preliminary data that need to be further validated by large-cohort multi-center studies. Besides, RFA surgery has a few disadvantages as well. For instance, due to the scalpel tip design, this technique may not be applicable for certain sites such as subglottic and anterior commissure tumors without compromising safe margins. Nonetheless, with the modified tip types, such as the ones with more angles available or smaller sizes, doing more accurate surgery will be possible. This study is also limited by a short postoperative follow-up period. 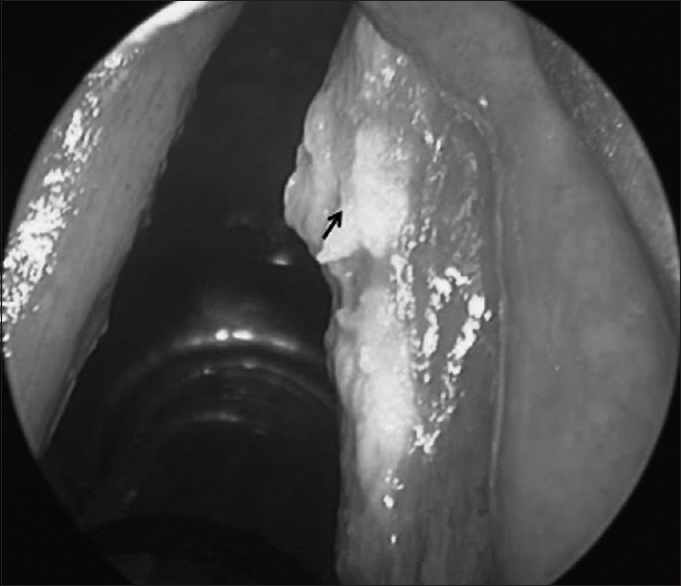 Therefore, extended follow-up case studies in parallel to CO2 laser surgery or laryngofissure will be further required to confirm the feasibility and effectiveness of low-temperature RFA for laryngeal cancer. 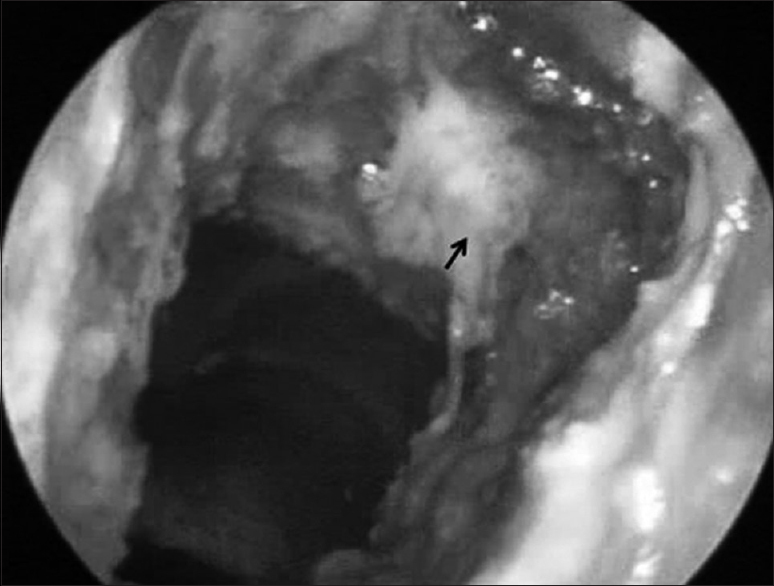 Low-temperature RFA is a safe and effective technique for the endoscopic resection of early-stage glottic tumors. It involves minimal, if any, postoperative complications, and the patients recuperate normally to achieve a good quality of life status. We thank all our colleagues from the Department of Otolaryngology as well as staff from the Laryngoscope Department for help with this study. We also appreciate our patients' cooperation. This work was funded by Innovation Fund Project of Xuzhou Central Hospital in 2012. Carney AS, Timms MS, Marnane CN, Krishnan S, Rees G, Mirza S. Radiofrequency coblation for the resection of head and neck malignancies. Otolaryngol Head Neck Surg 2008;138:81-5. Gershenwald JE, Fidler IJ. Cancer. Targeting lymphatic metastasis. Science 2002;296:1811-2. Greene FL, Page DL, Fleming ID, Fritz A, Balch CM, Haller DG. AJCC Cancer Staging Manual. 6th ed. New York: Springer-Verlag; 2002. p. 27-33. Alexiou VG, Salazar-Salvia MS, Jervis PN, Falagas ME. Modern technology-assisted vs conventional tonsillectomy: A meta-analysis of randomized controlled trials. Arch Otolaryngol Head Neck Surg 2011;137:558-70. Roy S, Reyes S, Smith LP. Bipolar radiofrequency plasma ablation (Coblation) of lymphatic malformations of the tongue. Int J Pediatr Otorhinolaryngol 2009;73:289-93. Mendenhall WM, Werning JW, Hinerman RW, Amdur RJ, Villaret DB. Management of T1-T2 glottic carcinomas. Cancer 2004;100:1786-92. Chinpairoj S, Feldman MD, Saunders JC, Thaler ER. A comparison of monopolar electrosurgery to a new multipolar electrosurgical system in a rat model. Laryngoscope 2001;111:213-7. Timms MS, Bruce IA, Patel NK. Radiofrequency ablation (coblation): A promising new technique for laryngeal papillomata. J Laryngol Otol 2007;121:28-30. Haughey BH, Hinni ML, Salassa JR, Hayden RE, Grant DG, Rich JT, et al. Transoral laser microsurgery as primary treatment for advanced-stage oropharyngeal cancer: A United States multicenter study. Head Neck 2011;33:1683-94. Martin A, Jäckel MC, Christiansen H, Mahmoodzada M, Kron M, Steiner W. Organ preserving transoral laser microsurgery for cancer of the hypopharynx. Laryngoscope 2008;118:398-402. Powell NB, Riley RW, Troell RJ, Blumen MB, Guilleminault C. Radiofrequency volumetric reduction of the tongue. A porcine pilot study for the treatment of obstructive sleep apnea syndrome. Chest 1997;111:1348-55. Li KK, Powell NB, Riley RW, Guilleminault C. Temperature-controlled radiofrequency tongue base reduction for sleep-disordered breathing: Long-term outcomes. Otolaryngol Head Neck Surg 2002;127:230-4. Rich JT, Liu J, Haughey BH. Swallowing function after transoral laser microsurgery (TLM)±adjuvant therapy for advanced-stage oropharyngeal cancer. Laryngoscope 2011;121:2381-90. Grant DG, Hinni ML, Salassa JR, Perry WC, Hayden RE, Casler JD. 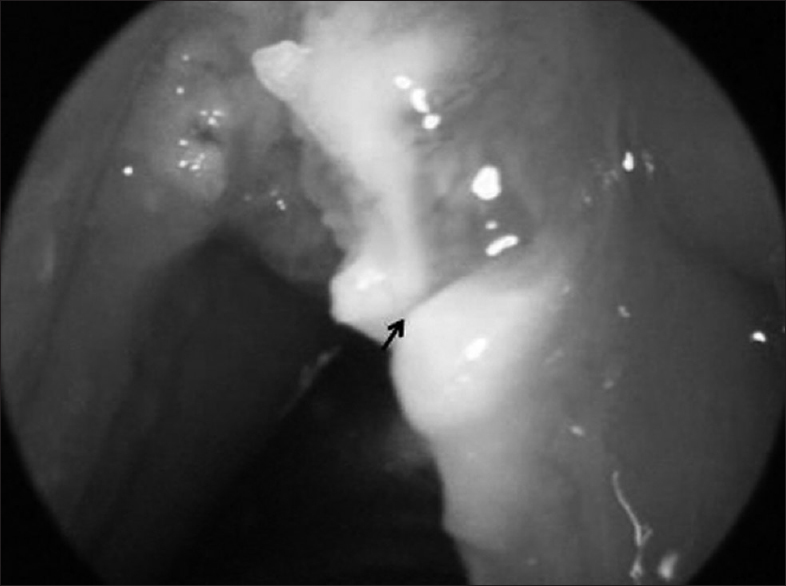 Oropharyngeal cancer: A case for single modality treatment with transoral laser microsurgery. Arch Otolaryngol Head Neck Surg 2009;135:1225-30. Tian SC, Sun YQ, Liu J. Application of radiofrequency ablation in otolaryngology head and neck surger. J Med Res 2009;8:113-5. Carney AS, Evans AS, Mirza S, Psaltis A. Radiofrequency coblation for treatment of advanced laryngotracheal recurrent respiratory papillomatosis. J Laryngol Otol 2010;124:510-4. Arya AK, Donne A, Nigam A. Double-blind randomized controlled study of coblation tonsillotomy versus coblation tonsillectomy on postoperative pain in children. Clin Otolaryngol 2005;30:226-9. Saengpanich S, Kerekhanjanarong V, Aramwatanapong P, Supiyaphun P. Comparison of pain after radiofrequency tonsillectomy compared with conventional tonsillectomy: A pilot study. J Med Assoc Thai 2005;88:1880-3. Di Rienzo Businco L, Coen Tirelli G. Paediatric tonsillectomy: Radiofrequency-based plasma dissection compared to cold dissection with sutures. Acta Otorhinolaryngol Ital 2008;28:67-72. Utley DS, Goode RL, Hakim I. Radiofrequency energy tissue ablation for the treatment of nasal obstruction secondary to turbinate hypertrophy. Laryngoscope 1999;109:683-6.